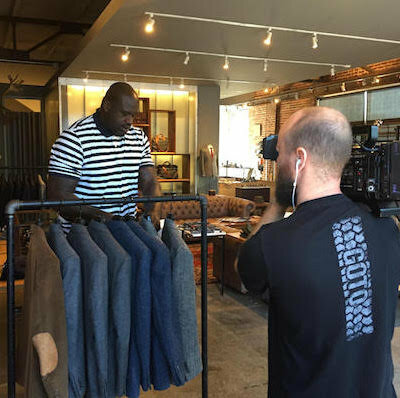 Our Atlanta video crew, Brent Ebell, and Nashville video crew, Peter Leininger and Chris Halleen, teamed up with Turner Sports and American Express to highlight the importance of “shopping small” on Small Business Saturday with the not-so-small Shaquille O’Neal. 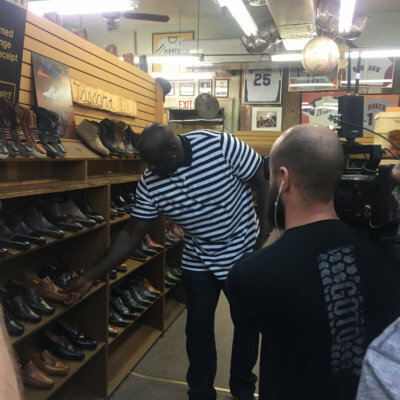 Our Atlanta video crew and Nashville video crew recently worked with athlete, analyst and brand champion SHAQ on a shoot in Atlanta and, as the day went on, learned a lot about the basketball legend. For example, the man is hilarious. Usually, when you see a celebrity in person they don’t have that same charm they have on TV. Not Shaq. He’s that exact same fun, energetic, and goofy personality in person that he is on TV. He even competed with one of the shop owners on who could get through the shoot with the least amount of retakes. Competition is in his blood. Yet Shaq also has the ability to make someone he just met feel like an old friend. Shaq was happy to highlight Small Business Saturday with Turner Sports and American Express by shopping at stores he has been going to in downtown ATL for years. He started at The Beehive for some handmade items like “clean undies” scented candles and manscaping tools “for a friend.” He then headed over to Thomas Wages for some custom colored bow ties. His final stop was at Friedman’s Shoes. He has known the owners for years and loves that they know exactly what size shoe he needs. (Size 22 btw!) Our Atlanta video crew and Nashville video crew followed him around with multiple cameras all day. He’s huge in person! Personality. Talent. Size. You name it. From the NBA to SBS – Shaq does it all! 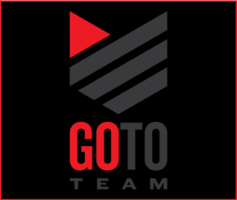 We were so excited to work with and become friends with one of the biggest names (and men) in basketball. Thank you for the great opportunity Turner Sports. Watch the full commercial HERE. Also be sure to check out some of our other shoots with Shaq like when he was inducted into the NBA Hall of Fame, when he was embronzed by the Lakers, when his mom tagged along, and when he DJ’d at TomorrowWorld.